Recently, Brendan Strejcek started a discussion on Google+ regarding an observation that Michael Pfaff had made: there don’t seem to be many how to build a good dungeon guides out there. Here’s mine. Let me provide some context: I like short dungeons. These dungeons would all make good candidates for the One Page Dungeon Contest even if they’re usually a lot less sophisticated compared to other entries. I think this is important: if you’re not planning on publishing your dungeon, don’t use published dungeons for comparison. For more generic advice on how to run a campaign, see my Swiss Referee Style Manual. For more specific advice on how to build adventures for higher levels, see How To Write A Module. If you need a checklist, see Quality Dungeons. I’ll be citing examples from the following three dungeons in my discussion below. Almost all my dungeons start as a lair of some sort. I usually go with what the campaign needs or by leafing through monster manuals, or both. → It’s an old water temple overrun with kuo-toas. It’s an old gnomish home overrun with ogres. It’s a pyramid where the priests of Set are sacrificing badger people to the snakes. All my dungeons must offer some sort of initial mission. There must be a reason beyond loot for my players to go there. Usually there is an initial goal provided by the campaign. → Get rid of the fish heads and the flying monkey will join the fight against the lizard men. Return to the home of your ancestors and retrieve the hidden family library. Get rid of the priests of Set and badger men will let your merchants join the harvest of the giant lotus. Most of my dungeons must offer some sort of significant treasure. I feel that rolling up random treasure according to the usual tables is most often not interesting enough. Special magic items work well for me. They are part of character advancement. They can serve as plot hooks to more adventures as the items are required to defeat certain foes, attract former owners, form part of a set. → The ogre mage has found the legendary sword Swampfire. The priest of Set has one of the ten rings of Qwaar the Axiomatic. The dungeons must offer more than one faction. This is how I introduce interesting non-player characters and invite negotiations allowing the party to turn factions against each other. Factions can also serve as a pool for new henchmen and replacement player characters. → The water temple also houses an evil necromancer. The ogres have captive halflings that need to be rescued. The priests of Set have enslaved badger people. Most of my dungeons have a trick or trap. Something that the players need to think through and overcome. → The water temple has a section that can be reached by an underwater tunnel. The final tunnel is protected by pit traps such that finding the first one is easy but jumping over it will dump you into the second one. The temple is protected by a pit of vipers and the characters can’t fly. If they can talk to animals, charm snakes, or use the yellow mold they encountered on the way here, that will avoid a fight against poisonous animals. Often, there are alternatives to bypass these challenges. These alternatives provide challenges of a different nature such that players can make a meaningful choice. → There is a stirge infested secondary approach in case the players don’t want to dive through the underwater tunnels. There is a crack in the ceiling leading to a room guarded by a wraith. The shaft where sacrifice is dumped leads into the heart of the complex, bypassing the pit of vipers. It’s connected to the pit of rats, however. There is an underground river connecting important rooms, but it is infested with ghouls. I try to incorporate a tactical challenge as well. → The tunnels make it possible for the kuo-toa to outflank and encircle the party. There are too many ogres for the party to take straight on. The ogres are asleep, however. If the party manages to avoid all noise, it is doable. The priest fights on a narrow bridge above a snake pit. I avoid linear maps. There is no player choice involved. In order to satisfy the urge for exploration, I like to add a few rooms that make sense. Not every dungeon needs a bathroom, but it’s cool if there are bodies of water, ventilation shafts and other mundane elements that players can explain to themselves. → A tunnel at the far end leading into the underworld. Animal lairs near the entrance. A pit full of rats to eat the dead. The rats are in turn used to feed the vipers. 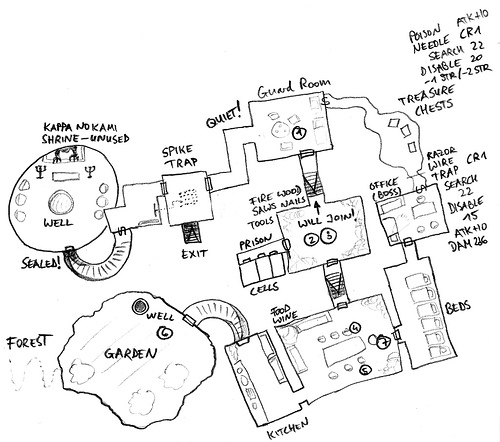 How do you handle the day-to-day bits of dungeoneering at your table? Like: how do you handle lighting, food & drink? Do you have rules for camping, guard duty, healing, i.e., undergrounds? How much effort goes into keeping track of encumbrance or calculating movement speed? And do you do random encounters in dungeons and how elaborate are your procedures for that? And how do your groups react and adapt, how does it affect play? I ask because I remember from my dungeoneering times that when I tried to follow more of the rules for dungeon adventures (this is was D&D Red Box and AD&D 2nd), I felt like doing quite a lot of bookkeeping. My group camped when they need to heal or to refresh their spell list. Leaving a dungeon for boring reasons like dwindling provisions was not uncommon. Some of this may not be particular to underground adventuring and a lot was probably due to my lack of experiences and insight into GMing. Still I feel like the wilderness leaves more space to negotiate with the world (and its rules) than then constraint environment of a dungeon. So, to take up Zak’s comment: Maybe designing a dungeon is easy, but playing a dungeon well is not straight-forward, or at least it does not follow directly from the classic game text as I read it. Or maybe I just did it wrong and nobody else encountered those issues? Good questions, all of them. I should write “How To Run A Dungeon”. On a Guide for New Dungeon Masters by Courtney Campbell on Hack & Slash. Dungeon Design and Stocking - with examples by Gus L. on Dungeons of Signs.